PRAYER PROMPT ••• It’s Thanksgiving Day, and across the country, people are thankful. Are we thankful when we’re stuck in rush hour traffic, late for work, with coffee stains down our shirt because we figured out too late that the lid wasn’t screwed on just right? Or when we just finished cleaning the house to find someone left stuff scattered all over the living room? Are we only thankful for what we have? Do we obey 1 Thessalonians 5:18, which says, “give thanks in all circumstances; for this is the will of God in Christ Jesus for you”? Friends – we live in such a fast-paced, competitive, greedy world. It’s easier than ever (thanks to social media) to compare our lives with others and wonder why we don’t have what they have. 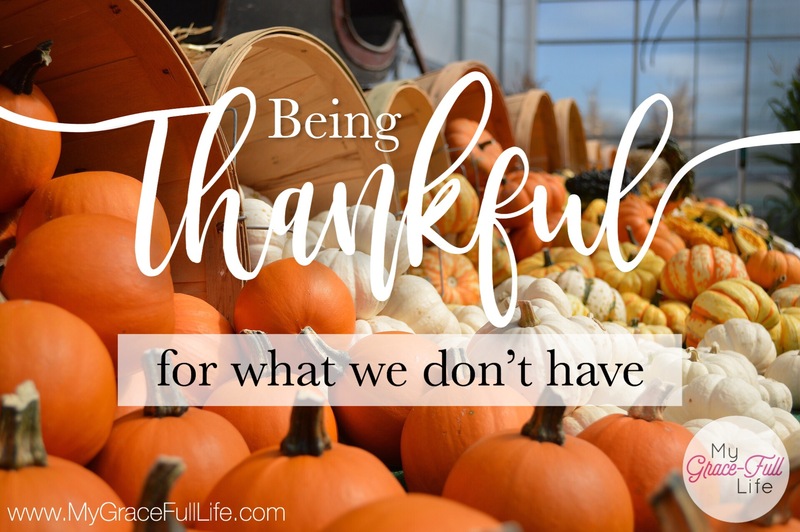 One day of thankfulness is hardly enough when we’re not thankful all the time or when we only focus on material possessions. It’s a great saying, but I think it’s missing something, so I’m going to tweak it a little. Saying you’re thankful for your car seems weak when you look with jealous longing at your neighbor’s new luxury vehicle. So, with that said, I’m putting a challenge in front of you today: make a list of things you’re thankful you DON’T have. I’ve been mulling this over since Sunday and am still struggling with it. “I’m thankful I don’t have a life-threatening illness,” is an obvious one. With some distance and perspective, can we be grateful God didn’t give us what we prayed for? Would you rather have the expensive, luxury car that looks pretty but is expensive to repair, terrible on gas, and really isn’t comfortable for a family? Or the dingy minivan that is paid off, gets good mileage, and has traveled through much laughter because the whole family fits comfortably inside? In the few days I’ve been thinking about it, I have found this exercise to be a great way to really “give thanks in all circumstances,” because it shifts our perspective. Today, as you pray, thank God for all He’s blessed you with, but also thank Him for the no’s, the circumstances you don’t face, and the things you don’t have. And thank Him, that because of Jesus, there are other things you don’t have: a hopeless future. And insecurity, to name a few. Because He gave you what we should all be most grateful for: salvation and eternal life with Him. What a great perspective! I love this!